Today’s puzzle of the day goes, once again, to the animal lovers. To be more precise, cute animal lovers are the only ones truly able to appreciate it. 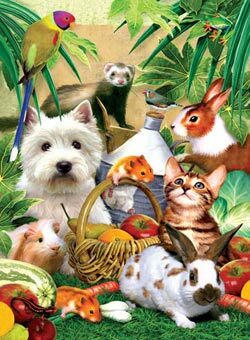 Made by Sunsout, Pets Picnic is a large piece jigsaw puzzle with a finished size of 18" X 24". Once you assemble its 300 pieces you will discover an amazingly fun and relaxing animal world that is at the same time incredibly human. Of course, you might have already figured that out from the jigsaw puzzle’s title. The picnic is a human invention, while pets are not human. This is a position easy to criticize, as the difference between pets and animals can be seen to lie in their degree of human friendliness, or perhaps even humanity. But enough with the intellectual debates, and let us get back to the puzzle. It features man’s best friends, gathered together around everything you need for a picnic. The picnic basket is guarded by one of the funniest looking dogs in the world, a West Highland White Terrier, surrounded by his friends. Two rabbits and a cat with another four furry little pets and a couple of other fellows complete the picture, waiting for you to be discovered. This is the sort of picnic that you can’t enjoy alone, and we recommend you to try it only if you’re accompanied by your family. Only then will you be able to taste the pleasures that this very special picnic has to offer. Expect happiness and a very peaceful state of mind.